In U.S. politics, a Kinsley gaffe is an occurrence of someone telling the truth by accident... The term comes from journalist Michael Kinsley, who said, "A gaffe is when a politician tells the truth." 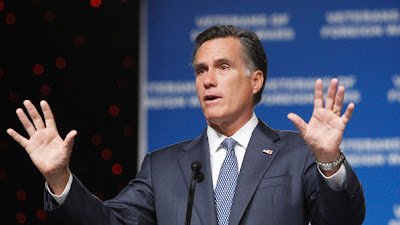 “In the general election I’ll be pointing out that the president took the reins at General Motors and Chrysler – closed factories, closed dealerships laid off thousands and thousands of workers – he did it to try to save the business,” Romney said Wednesday on CBS. President Obama has publicly touted his plan to “retool and restructure” the auto companies as “an investment in American workers.” Romney was strongly opposed to the auto bailouts, but on Wednesday likened the president’s strategy to his own. “We also had the occasion to do things that are tough to try and save a business,” he said. It's an awfully awful comparison, but I suspect there's more truth in Romney's statement than he would care to admit. With all of the cronyism and government bailouts at Bain, I fear that Romney’s accomplishments there exemplify the beauty of capitalism in the same way that Romneycare exemplifies the beauty of free markets. I'm not sure it's a gaffe. He's said before that sometimes, hard decisions had to be made in order to save a business. I think it's getting airtime now because of Solyndra etc. ; captialism in it's purest form isn't pretty for everyone all the time. Kinsley gaffe: politician tells the truth. Making millions of dollars off of government bailouts isn't capitalism at all. I'm sure it must be difficult for Romney to make the distinction because he and his family have been tangled up with government for so long. "There is general agreement that elements of capitalism include private ownership of the means of production, creation of goods or services for profit or income, the accumulation of capital, competitive markets, voluntary exchange and wage labor." This, unfortunately, is not ROMNEY's working definition of capitalism.